It’s been a little over 15 months since the aircraft was lifted from the bottom of the Dover Straits and transported to the Museum’s Cosford site for ground breaking conservation work. The process so far has seen the aircraft systematically sprayed with a low concentration citric acid based solution inside purpose built hydration tunnels. This process has helped to remove marine accretions and subsequently the neutralised corrosion impurities in the aluminium aircraft structure. The project is progressing at a much faster rate than previously anticipated and the Museum is delighted to see second stage conservation work commence on the aircraft’s forward fuselage. Confident that the citric acid solution has done its job, the fuselage was removed from the tunnels early September and has undergone an intense wash down, before being moved into the Conservation Centre. “The citric acid solution has worked wonders on the large and small objects inside the hydration tunnels. It was a major milestone when the forward fuselage was removed from the treatment area and gave us the first indication that there was light at the end of the tunnel. We are not taking things for granted and we are keeping a careful eye on the section as she is quite fragile, but then anything would be after spending 73 years in the hostile Dover Straits. At the time of the Dornier’s recovery, it was unclear just how much of the aircraft could be saved following over seventy years on the seabed. Visitors to the Museum are invited to attend the Conservation Centre Open Week in November and see for themselves the fantastic progress being made on the aircraft, only a year and a half since it was raised from the Dover Straits. After a short set of negotiations the Newark Air Museum has completed the purchase of Hawker Siddeley Dominie T1 XS726 from Everett Aero of Sproughton, Suffolk. Funding for the acquisition has been provided thanks to the generosity of two long-standing museum members, Mike and Kathy Smith. 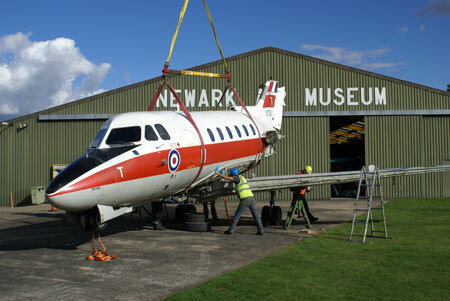 On Wednesday 24th September 2014 the airframe was delivered to the museum’s site in eastern Nottinghamshire, which is close to the border with Lincolnshire by a team from Everett Aero. As part of the purchase agreement the wings were refitted to the aircraft by the Everett Aero personnel. The Dominie fills an important gap in the museum’s themed display of training aircraft. The type was used to teach the skills of systems management, air leadership, decision making and teamwork to various aircrew members including: weapon systems officers and operators, air engineers and air loadmasters. The airframe retains its original configuration and is essentially complete. 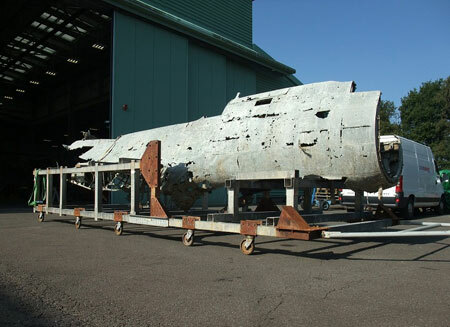 Once reassembled by the museum staff and volunteers XS726 will eventually be moved inside Hangar 2 at the museum. Here it will be displayed alongside several other training airframes, like the Varsity, Jetstream, Bulldog, Gnat and Jet Provost. XS726 is expected to retain its current training scheme markings. Dominie T1 XS726 was delivered to the RAF on 25th October 1965 and served at RAF Cranwell and with both 3 and 6FTS. Its final training role was as an instructional airframe (9273M) at RAF Cosford and it was delivered there on 24 June 1997. XS726 was moved to Sproughton in 2007. A brand new exhibition entitled ‘Pilots of the Caribbean: Volunteers of African Heritage in the Royal Air Force’ is due to open at the Royal Air Force Museum Cosford next Month. The exhibition opening will coincide with Black History Month, a national event celebrating the achievements of black men and women throughout history. The RAF maintains its commitment to recruiting the best personnel regardless of race, creed or colour and it is today considered one of the very best employers of people from minorities. The exhibition will highlight the RAF’s success in embracing diversity and demonstrate how the rich, cosmopolitan nature of modern Britain owes much to the black men and women who wore air force blue. 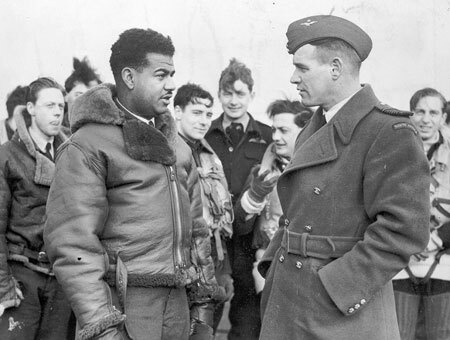 ‘Pilots of the Caribbean: Volunteers of African Heritage in the Royal Air Force’ will be on display at the RAF Museum Cosford from Monday 6 October 2014 in the Museums Temporary Exhibition Gallery, Hangar 1. Viewing the exhibition and entry to the Museum is FREE of charge. For more information visit the Museum website www.rafmuseum.org or call the Museum on 01902 376200. Ahead of The Duxford Air Show this weekend, IWM Duxford has released some important safety information:· IWM Duxford takes great care to ensure its air shows are as safe as possible for everyone involved. A rare chance to see the world’s only two airworthy Avro Lancasters close-up will be offered as part of this year’s Jersey International Air Display, taking place on Thursday 11 September. The aircraft, from the Battle of Britain Memorial Flight and the Canadian Warplane Heritage Museum, will form part of the show’s static display at Jersey Airport before and after their flying appearance over the Bay of St Aubin’s on Thursday 11 September. For a small fee, in aid of Help for Heroes, it will be possible to get up close to the pair of Lancasters – an opportunity only afforded at very few venues during the Canadian aircraft’s visit. Admission to the static display costs just £5.00 per person.Visitors are urged also to buy a copy of the show’s comprehensive souvenir programme, as this is one of the major means of funding the display. The free air display takes place over the Bay of St Aubin’s during the afternoon of Thursday 11 September. Over the years, Jersey has become renowned as one of the most imaginative airshows on the scene – indeed, in 2013 it was the recipient of the prestigious Paul Bowen Trophy, presented by the European Airshow Council to what it considered the previous year’s best European air display. Further acts may be added depending on sponsorship. In addition, a Polish Navy M28 Bryza 1R maritime patrol aircraft will form part of the airport static display, while helicopters on static display there, and in St Helier’s Lower Park or People’s Park on the day of the flying display, will comprise a Royal Navy Lynx, Merlin and Sea King. Aviation fans can experience the virtual skies next month as the Flight Sim 2014 event heads to the Royal Air Force Museum Cosford in Shropshire. 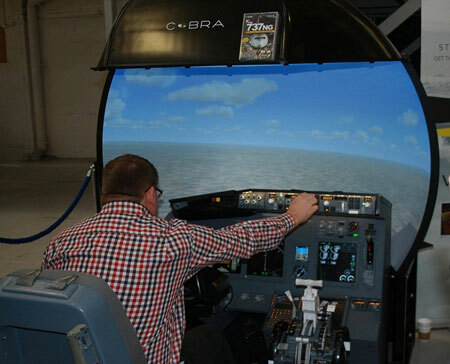 Taking place on Saturday 4 October, aviation enthusiasts will enjoy a day packed with all the latest flight simulation software and the chance to test out their virtual flying skills. Just Flight and Flight 1 Software, two of the UK’s leading flight simulation software publishers, will be hosting this major gathering in association with PC Pilot magazine to show visitors the very best in desktop flying. Building on the success of last year’s event, organisers are anticipating over 2,000 visitors will attend the one day show. Advance tickets for Flight Sim 2014 are now on sale online for just £5 per person, with free admittance for under 16s accompanied by an adult. Tickets purchased on the day cost £10 per person. For further information on the event or to purchase your tickets in advance, please visit the show’s website www.flightsimulatorshow.com.